I started the year in Palestine. It felt so good to be there. I was in a place so far removed and isolated from most of my other life outside of the occupation. I feel privileged to be able to visit, to go when I can and when I want. A privilege my mother passed on to me and my brothers. I am able to visit because my mother made sure to take me to Tulkarem and register me in her permit. The Lam Shamel system of exit and entry permits into the Occupied Territories called the West Bank. A system of papers, and cards and stamps from Israel and Jordan that allows some of us Palestinians the right to visit and leave through the King Hussein Bridge (aka Allenby). We are allowed this privilege because we are Palestinian Jordanians. 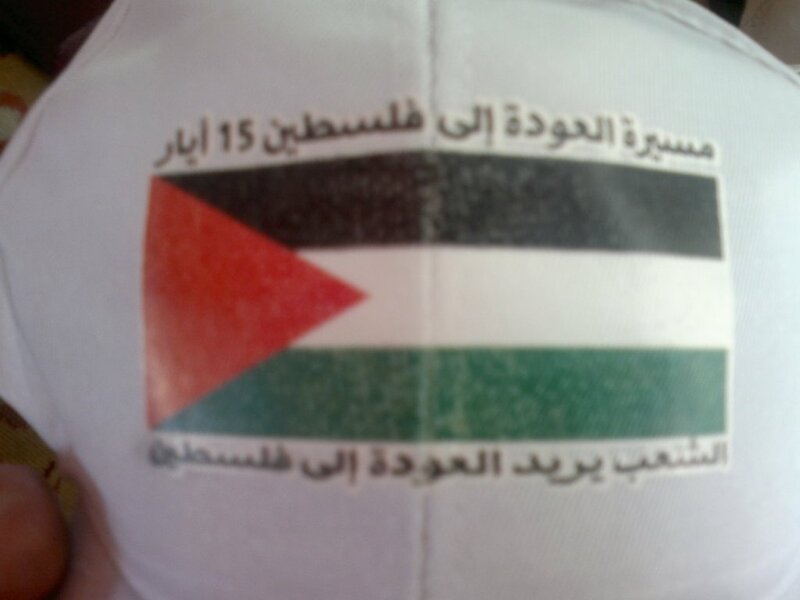 That part of Palestine was under Jordanian Mandate from 1948-1967, a time when the Palestinians of those territories were considered Jordanian citizens, and still are depending on where you were in 1988, but that is another story for another time. Throughout the years the crossing had gotten harder and easier. My earliest memories were of strip searches and over turned bags with Israeli soliders running every article of clothing through their gloved hands. Our shoes in a box filled with other peoples shoes and you had to rummage through them to find yours; Oh what a horribly stinky pile of shoes it was, especially in the summer. And this was after you and your family were crammed in to a cubicle behind a screen, striped down to our underwear for the Israeli soldier girl (they were and still are so young) to come pat us down. These pat downs then progressed to being wanded down, still in our underwear. Now we walk through that security frame that we know so well and only when it beeps do we get the pat down. But we have no choice in all of this. Our bodies, our identities, our belongings all subject to the sadistic security practices of an occupying force afraid for its security. And it is these memories of humiliation, the excessively long and detailed searches to the skin, the heat of the Jordan Valley in the middle of the day, the stench, the lines, these are the memories that stay with you as you grow up despite the constant changing and even easing of the procedures. It is those memories that has served Israel so well today as a whole generation of us has grown up and taken the decision, the only decision, the only choice we have and decided to stay out. My brothers and cousins are some of those that have made that decision. They are all grown up and no longer need to be dragged by their mothers and fathers to visit the family in Tulkarem. Especially with the passing of my grandparents, the ties that bind us get weaker and weaker. The older generation feel less of a need to visit their home town and only go when there is paperwork to be signed. Even then, one of my uncles who lives in Palestine may bring it up with him and finish the paperwork in Amman. So why would my brothers and cousins go? Why would they cross the Jordan when all they can remember is the unreasonably early start, the unbearable heat, the stench of pressed sweaty bodies packed in to a small area, and the humiliation and disrespect of the Israelis. With that memory and that trauma the crossing becomes such a stumbling block for the Palestinians and such a success for the Israelis. The Israelis have succeeded in making us the second generation of permit holding Palestinians from the Occupied Palestinian Territories (West Bankers) in diaspora “choose” to disenfranchise ourselves even further by making the decision not to cross the Jordan, not to renew permits, and for some even give up the right to visit. It angers me so much to think that they are willfully giving up their papers or ignoring them and jeopardizing their rights and their children’s rights to Palestine. That they very easily disregard the sacrifice, the struggle, the humiliation and oppression our parents went through to make sure we would have our rightful place in Palestine. That they have given up. Every time I visit Palestine I ask my uncles “who of my cousins has come to visit?” Their responses are discouraging and disheartening. The only ones that visit are those that come for paperwork and they are few and far between. It feels to me that my family members in Tulkarem are forgotten they are names with faces frozen in time 10-15 years ago. It feels that with the passing of time they are being dropped from their daily consciousness, just like they are dropping Palestine and the reality of Palestine, making it a faded memory. I don’t think my cousins read my blog, but in case they do or someone in a similar situation is reading it, I urge you, I implore you to visit, and to continue to do so, go learn about Palestine. Go to other towns and villages. See what is happening, talk about what is happening, connect, learn, understand and don’t just be a number counted out in statistics. Don’t let them win this way. In two days time I cross the Jordan into occupied Palestine. I will go there to bring in a new year. I find it so strange to say I am celebrating in Beir Zeit. It sounds so wrong, so problematic. I am going to my home, my land, my people and yet I feel such guilt at wanting to spend my new year there. I feel guilty about being in my country. I feel guilty for wanting to be with my family and friends, my people. I feel guilty for wanting to celebrate and laugh and be joyful as there are guns and tanks and a bloody apartheid wall. I feel guilty with so many people held in prisons, so many people separated from their families so many people suffering under occupation. It is just so wrong. Yet, another part of me screams something entirely different. It screams of entitlement. I should not have to feel guilt nor should I apologize for being home, for wanting joy in my land nor should I apologize for celebrating where I justly should and could. The occupation may control and restrict my movement. The occupier may tell me I am “illegal” in my own country if I don’t have the right permit. The occupation may build a wall that separates me from my family and friends on its other side behind concrete, electric fences and check points. The occupation may imprison my cousins and uncles, torture and beat them. But the occupation will not quell my spirit. It will not so disenfranchise me that I have no joy or life. I resist by crossing the Jordan to what is rightfully mine. I resist by walking in my family olive grove. I resist by meeting my friends and sharing a moment of joy with them. I resist by living. And for that I will not apologize, and I will cross the river and I will go to occupied Palestine and celebrate there because I can and I will and the occupier (for now) can not stop me. 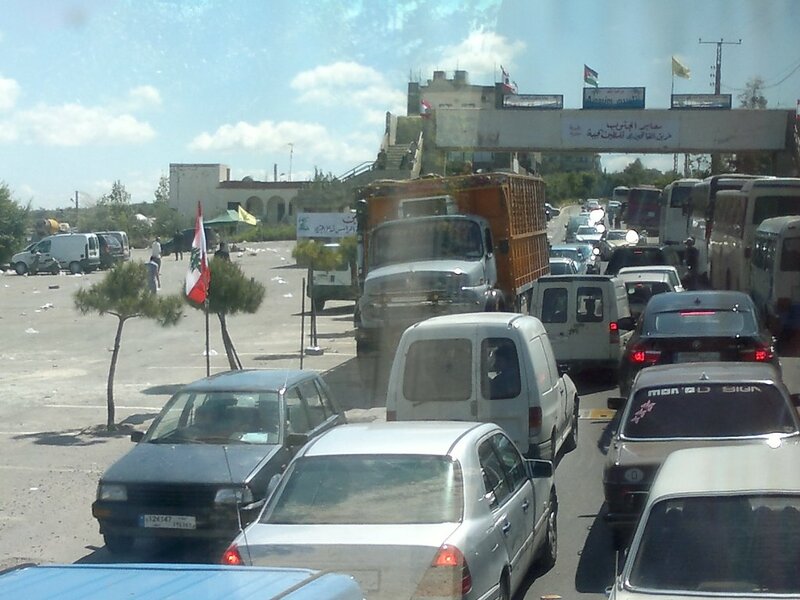 I started to write this on my way home after a day that started way too early for the weekend, but if truth be told it is like any day that is a day for going to the Palestinian border. It started with the scramble to find the bus that will take us there. We had to reserve days before, yet we were told all the buses were full. We went anyway, and secured the last seats on one of the buses organized by AUB’s Civic Welfare League. We headed off at 7:15 a.m. to Maroun al Ras, but first a stop in Shatila. We needed to drop off the extras on our bus. Instead we found more people and no bus. 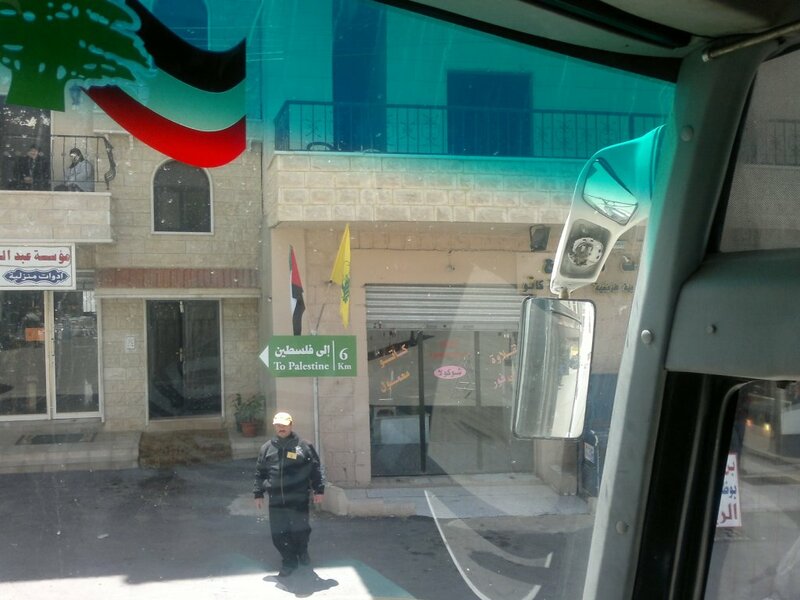 “All 2500 Lebanese buses have been commissioned and about 1000 more from Syria,” our bus driver told us. “They are expecting 150,000 thousand people,” he said. We all pitched in to hire another bus, where from I have no idea, but everyone was going to go. We pulled away and started off, and for the next three hours we kept seeing crowds. Some were on the street waiting for their buses, others in bus, after bus, after bus. Slowly, excitement replaced the morning grumpiness. 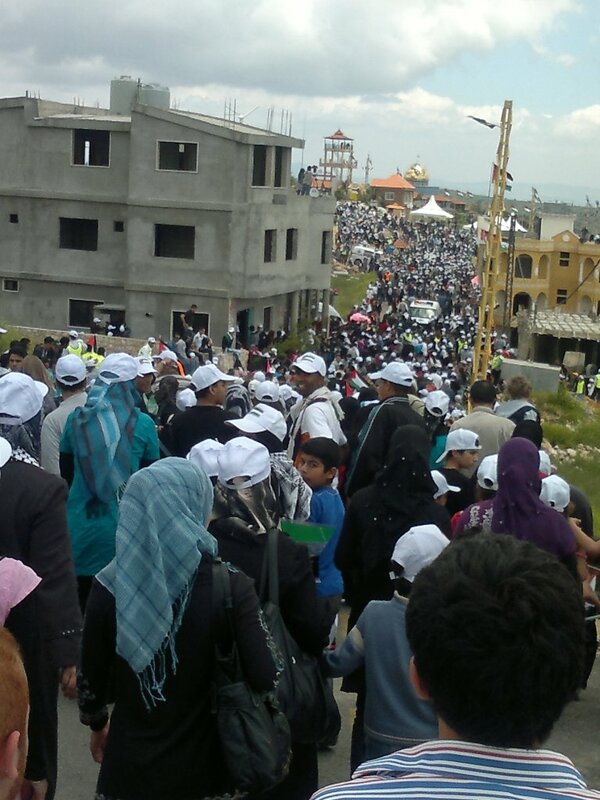 And with every kilometer we got closer we saw more and more people, and more and more buses. Just before we got to Sour, we were stopped. Not to be asked for our IDs or to be searched. It was not a military checkpoint, but rather the organizers. They were counting and logging. Bus number? From? How many passengers? The enormity of the organization slowly sinking in with every bus on the road, and every florescent vested organizer we saw. Once we passed Sour, and at every possible turn there were organizers with walkie talkies, and they waved us on in the right direction. At every three or four kilometers there were signs saying “To Palestine, X Kilometers.” With every sign we saw we became more jubilant “TO PALESTINE.” Our bus driver, Zafer, was a darling. 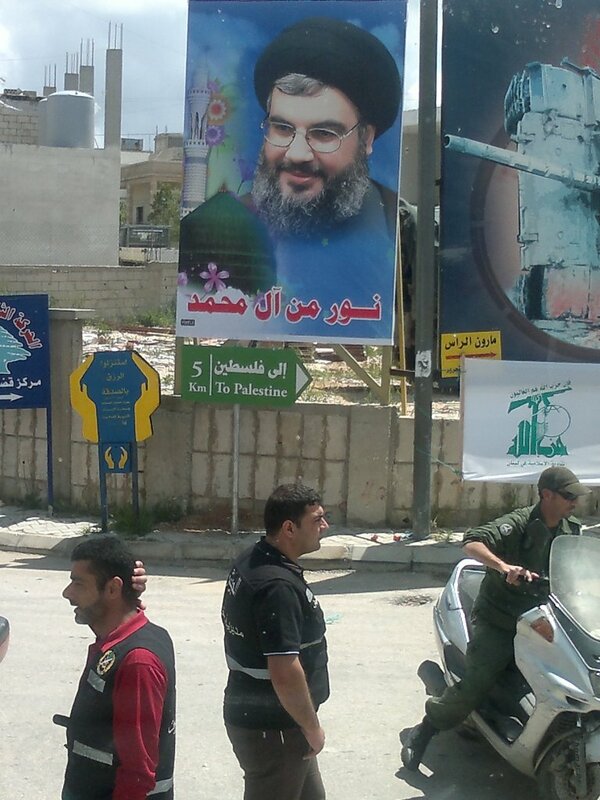 He would pick up the mic and point out towns and villages, he spoke of Hezbollah resistance and fighting the Zionist enemy, he gave us snippets of his wisdom, and he told us about the festival we were going to attend, as this was the fourth year it is being held. He made the trip that much more. At the four kilometer point we were given caps and flags. At the three kilometer point we disembarked, we had to walk the rest of the way. And so we strolled, with hundreds of others down the path, past the two kilometer marker, and then we saw it. We saw occupied Palestine with its settlements, farm lands, and the electronic fence that marks much of the boundaries and walls the Israelis put up. There it was the valley below in all its spring glory. 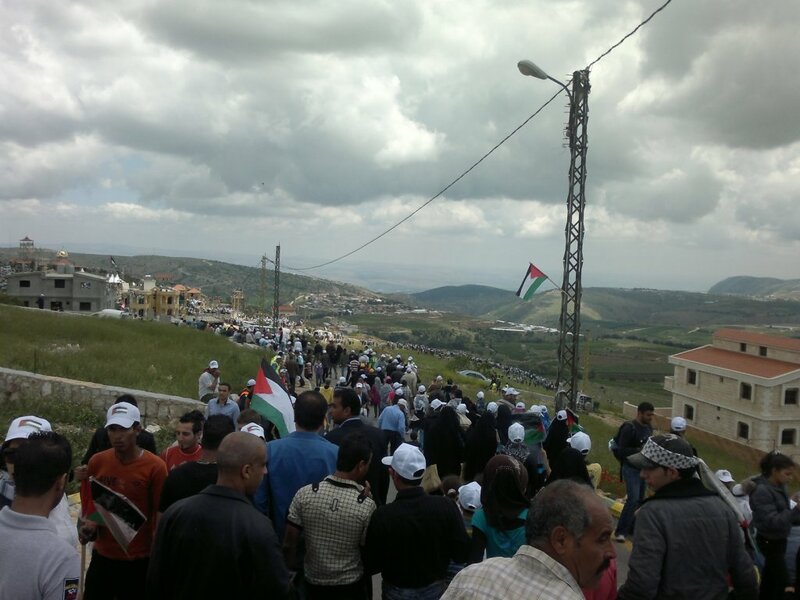 Below we saw people near a dirt road, we weren’t sure we thought they were Palestinians of 48. We later found out that they were people trying to get to the fence, still on Lebanese soil. We continue to walk, past food vendors and organizers who made sure we didn’t stray off the path. We passed a gateway that read “The Iranian Garden” where people’s bags were being checked. And we walked in to see a massive sign in Hebrew and Arabic saying something along the lines of we shall return. There was a festival area segregated by gender, and we walked into the Women’s one. 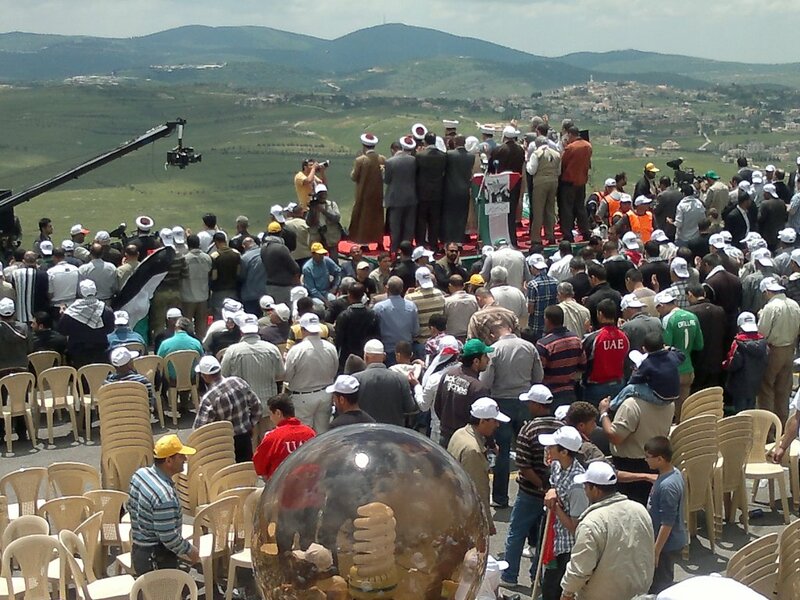 There we tried to find a way down to the slope, we wanted to sit on the grass and just gaze at Palestine. Instead, we found no way down and were subjected to the ranting of whoever was speaking on the mic. Soon we heard gun shots, not one, or two, but a whole array of bullets. We looked at each other and decided to take higher ground. But it felt like slow motion. I was amazed at what I saw. The women who were sitting down in the front rows stood up as if in unison and waved the Palestinian flags they were holding in defiance. Others started to gather their children who were crying in fear, wanting to get them to higher ground. It was sad seeing how quickly the children, traumatized by years of violence, started crying immediately and just wanted to go home. Ironically, home was the one place they couldn’t go, not in that moment. And so we walked up to what seemed like a safer distance, we stopped to catch our breath and try to understand what just happened. We were told this was Lebanese army fire trying to keep back people who wanted to go to the fence, and we should not be scared. It didn’t make sense. In such an environment, in such a location, with so many people, why would you fire shots? Even if they were in the air? We had made an agreement amongst us, the small group of three, that we would a- stick together, b- respect, and not question anyone’s decision to leave, or move at any time. And so we decided to go find a grassy spot to sit on, and from there watch and see what was happening in the valley below, but from a location farther away. And so we continued to move at a very slow pace back up the path. The atmosphere was slowly going back to that of a festive crowd at a picnic. People milling about, eating, walking, watching, smoking. We stopped for a bite to eat as it was nearly 2:00 p.m. and we hadn’t really had breakfast. But we realized the sound of sirens kept getting louder, and more frequent. We kept trying our phones, but the signal was weak, and kept coming in and out. Finally, someone on the phone told us the news. The shooting was not friendly fire anymore, and there were casualties, and deaths already. 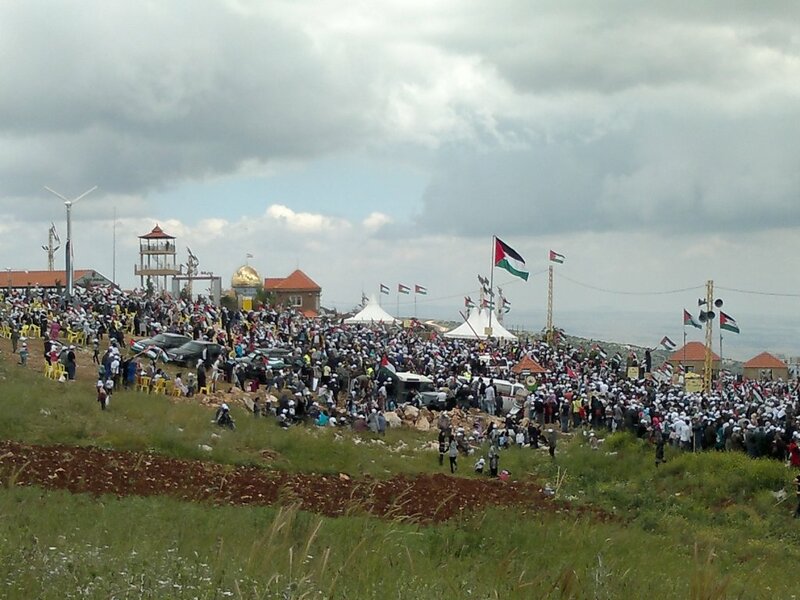 The Israelis had opened fire on the unarmed protesters at the fence. We kept trying to get more information from around us, from the internet, from others with access to TVs and radios. It was unclear how many were dead, and how many were injured. Numbers ranged from 3 to 50! We walked out and up, we were trying to get a glimpse of what was happening, and find out more information. We kept being pushed aside by soldiers running ahead, clearing a path on the crowded road, to make way for more ambulances coming out of the site. So many ambulances. They were on both roads the one we were on, and the dirt road below that we saw earlier. We were able to see the crowd from afar and the people running back and forth. We saw the Lebanese army mobilize in the valley below us, but when we saw the army trucks drive past us to mobilize on the top of the hill, that’s when decided it is time to leave. There was nothing we can do, except move. Slowly, we made our way to the bus. All the while trying to call friends who we knew were there but couldn’t find, the phones were still not fully functioning, and everyone was desperate for a connection. It took us over an hour to find our bus.Wwe walked through the parking lots, and then down the winding line of buses parked on the side. We were lucky it just three quarter ways down the hill, others still had a long way to go. We had thought if we found it, and found out when it would leave, we could walk back and see what was happening. But with an hour or so each way, and no phones, emotionally and physically tired, we stayed, and slowly the stories started to come in. People with pictures, film and experiences started to tell us of the horror that was taking place as we stood. The worst of which was one person from the AUB group, a student, had been shot in the back. It was the worst because that story just didn’t end with a retelling, or hearing the number of deaths and causalities. But because his friend who was with him needed to found and told, we were called and asked if any of us have the blood type (O-), as he was in desperate need. We had to drop of his friend who’s phone had died and was franticly trying to find more information, contact the dean, contact the friends, contact anyone who could contact his mother. It still doesn’t end, as today I have heard he has been airlifted into AUH, in critical condition. He had been shot with a dum dum bullet that ripped through him. He has already lost a spleen, a kidney and parts of the bullet are lodged in his spine. There are so many details that I can’t begin to piece together. The landmines that were still down there, the boy who lost a leg being pulled away from the fence as the shooting started, the young man who was walking amongst us his clothes completely soaked in blood. The fear and anxiety in some and the matter-of-factness of others. All of us knew the monster that is the Israeli soldier. My story is not an exceptional one as you may have read and heard much more from the people who were at the fence. You may have read the news (I haven’t. I want to try and make sense of what I saw and heard already). This violence is nothing new, it just a fact. Israelis continue to use excessive force when they see a stone being lobbied against them. The use excessive force when a child stands in their way. They use excessive force when they see a Palestinian Flag. They try to erase us. They tried at Maroun Al Ras, and they couldn’t. They tried in the Golan and they couldn’t. They tried in Al Karama, Amman, and Cairo, and they couldn’t. They tried in Qalandia, Gaza, and all our Palestinian cities and towns, and they just can’t. May 15, Nakba day is the day we will all remember. No matter how many people they kill, No matter how many demonstrations they stop, no matter how many homes they destroy. No matter. Palestine is my homeland.